French President Emmanuel Macron delivered his second speech in a week on Tuesday in an effort to alleviate tensions after weeks of climate-policy protests left hundreds wounded and two dead. Macron addressed protesters in a speech last Thursday, but his tact failed to quell the unrest, and he attempted to once again address French concerns in an hour-long televised address on Tuesday. French protestors, largely from smaller towns and the countryside, have blocked roads and marched to protest fuel taxes. They have come to call themselves the "gilets jaune," or "yellow jackets," because of the fluorescent yellow safety vests they wear. Macron's government first introduced the gas tax to combat climate change and bring France into compliance with the 2016 Paris Agreement. The tax spiked gas prices and presents a crisis for Macron's upstart government, which defied orthodoxies and built a popular coalition in May 2017. Benjamin Griveaux, a government spokesman, worried that "one must never set the environmental fight up against social justice." Though this particular tax costs only a fraction of a percent of quarterly growth, it adds to a French tax regime that tops 45 percent of GDP, the highest in Europe. In a speech to 2,000 mayors of beleaguered towns last week, Macron said the solution was to "improve dialogue." His tone was taken by many as condescending, and the substance unserious. Macron said he was open to "hearing the anger," but he would not listen if it was presented "in a demagogic fashion." The speech did little to satisfy the mayors or those in the streets. French officials estimated approximately 90,000 people, most outside of Paris, participated in the initial protests nationwide. In the last few days, total numbers fell, but intensity picked up in Paris, where the ranks of yellow jackets swelled. Protestors broke windows on the Champs-Elysees and police fired tear gas over the weekend, forcing protestors away from the presidential palace. Footage from the Agence France-Presse showed parts of Paris in chaos. The protests, which began mid month, have resulted in at least 600 wounded and two dead, according to the Ministère de l’Intérieur, France’s department of domestic affairs. Dominique Reynié, of Sciences Po, called the protests a "profound crisis." They are the "most impressive event since Macron came to power," he said. In his speech Tuesday, Macron struck a different tone. In the hour-long televised address, Macron recognized the legitimate grievances of those peacefully protesting, and called for a three-month national consultation to give voice to all groups. 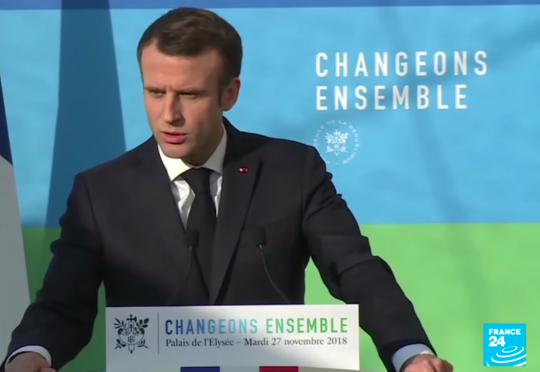 He spoke about other ways France would meet its environmental and energy targets, including replacing its nuclear power plants. Macron promised France's future did not involve a bifurcated country, with different parts of the country advancing at "two speeds." Those who routinely felt "they were always making sacrifices" for the rest of the country "are right," he said. This entry was posted in Politics and tagged France, Paris Climate Accords. Bookmark the permalink.